Bram Stoker was born in Dublin, and a fully-fledged festival now celebrates the author. Bram Stoker was born at 15 Marino Crescent in 1847, to Abraham Stoker and Charlotte Mathilda Blake Thornely. He was the third of seven children, and spent the first seven years of his life in bed due to a mystery sickness (“the leisure of long illness gave opportunity for many thoughts which were fruitful… in later years,” he would write). Stoker spent two years at the house, a three-storey affair set on a leafy Georgian crescent overlooking Bram Stoker Park and Dublin Bay. It is privately owned. Clontarf is also home to a seafront Bram Stoker Hotel and the Stoker Dracula Museum, a quirky enterprise run by a local historian to the building’s rear. “Stoker is Clontarf’s sleeping giant,” says Denis McIntyre, who intersperses his artefacts and early editions with regular AV shows. What could trump a tour of Dublin’s most haunted nooks and crannies? 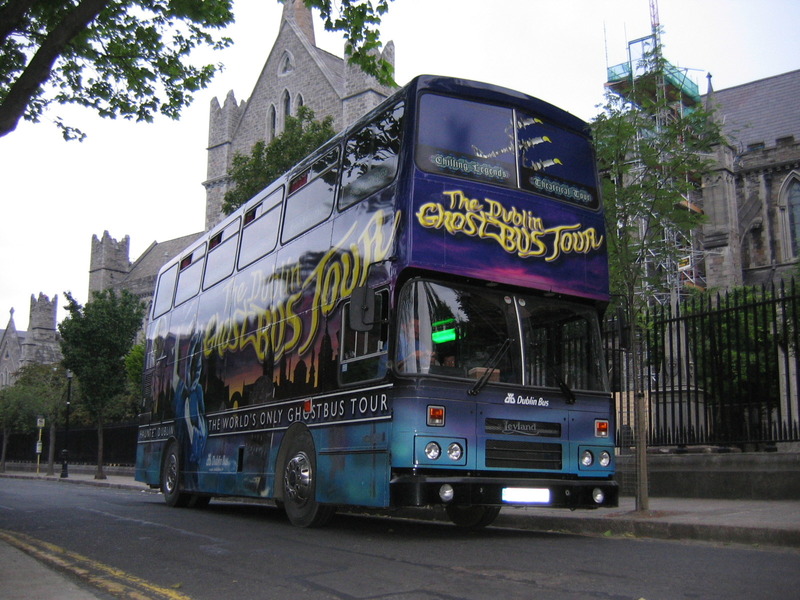 A tour on board the macabre mobile theatre that is Dublin’s Ghostbus, that’s what. Step into the curtained saloon upstairs (if you dare), and you’ll embark on a two-hour jaunt through a parallel universe of felons, fiends and phantoms, with actors spinning yarns along the way. Stops include St. Kevin’s graveyard, the candlelit crypt of Christchurch Cathedral, and naturally, several sites associated with Dracula’s creator. 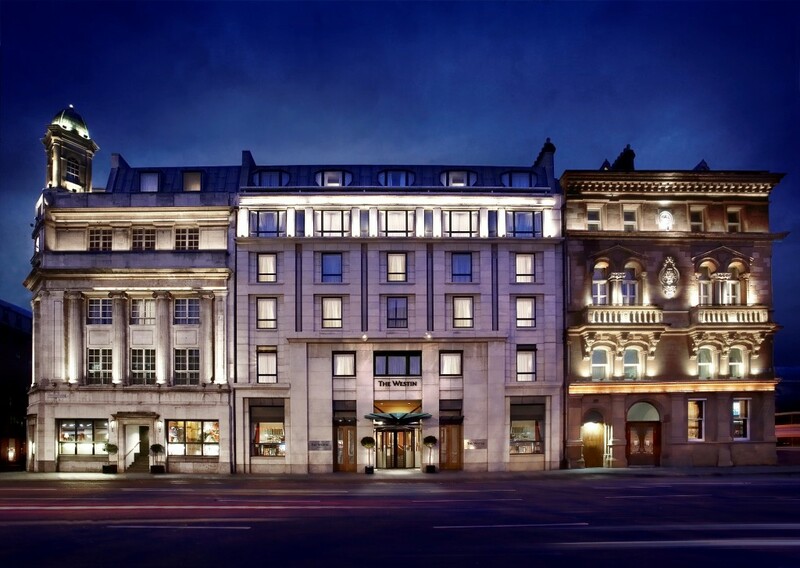 The Ghostbus passes Trinity College, where Stoker studied, the house where he lived at 30 Kildare Street, and the Shelbourne Hotel, where he met Henry Irving, the man who invited him to manage the Lyceum Theatre in London, where he went on to pen ‘Dracula’. Details: 01 703-3031; dublinsightseeing.ie; €28 (not suitable for children under 14). Bram Stoker was a regular visitor to Archbishop Marsh’s famous library (a record of books checked out by the author on July 13th, 1866, includes works by Spencer and Dryden). Dracula doesn’t have any dealings (that we know of) with the Westin, but that hasn’t stopped the five-star hotel unveiling a room named after his creator. Guests needn’t get carried away with visions of coffin-shaped cribs and cobwebs on the walls, however – the room is one of nine refurbished suites named after Irish authors, though it is kitted out with copies of Dracula and lesser-known Stoker tomes like The Lair of the White Worm and The Lost Journal. The Westin currently has writers’ rooms from €246 per night. Trinity was Bram Stoker’s alma mater, and by all accounts, he sunk his teeth into college life every bit as wholeheartedly as Dracula did his victims’ veins. During his time at Trinity (1864-1870), Stoker served as Auditor of the Historical Society and President of the Philosophical Society – at one point proposing fellow writer, Oscar Wilde, for membership. He was also heavily involved in sport at the university. Visitors can enter Trinity’s campus freely, and of their own will, though you may be spooked by the €9 fee to visit the Old Library and Book of Kells. The creepiness quotient rises by night, when clip-clopping footsteps echo over the college cobblestones. Details: tcd.ie/visitors; €9 (Old Library/Book of Kells; kids go free). Both of Bram Stoker’s brothers trained at Dublin’s Royal College of Physicians, the oldest surviving medical institution in the country. 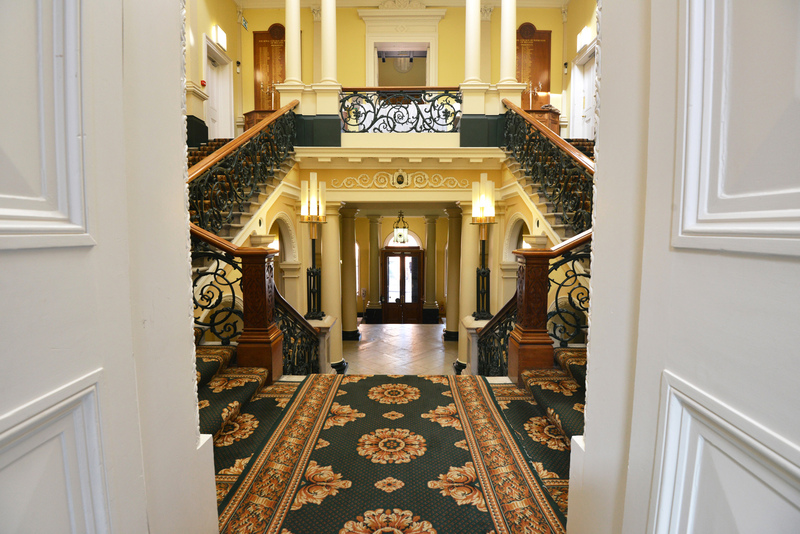 Its Kildare Street building was refurbished in 2005, and tours are available by appointment with the Heritage Centre. Could Dracula have had a stake in Ballybough? Bram Stoker grew up nearby in Clontarf and Artane, and fans say he’s likely to have visited a former cemetery in the area known for its “suicide plot”. In this unconsecrated patch, robbers and highwaymen were interred along with those who had died by suicide, and wooden stakes are said to have been driven through their hearts, to prevent their spirits from wandering. Readers don’t have to look far to find a similar device in ‘Dracula’ and other vampire lore, though you’ll have more trouble finding the cemetery. It has long since disappeared. Details: The 51A and 123 buses stop at Clonliffe Road. 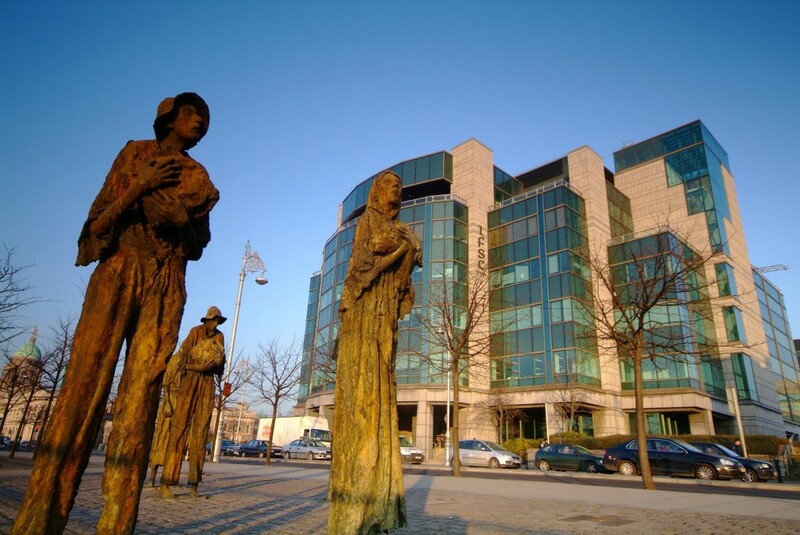 The haunting bronze figures depicted in Rowan Gillespie’s ‘Famine’ are as close as contemporary Dublin gets to the walking dead (or un-dead). The staggering, emaciated figures commemorate a tragedy Stoker would have been deeply aware of – having himself been born in Black ’47. Something else Stoker may have drawn on were Ireland’s 19th century cholera outbreaks. His mother told her young boy stories of “the walking dead” and victims buried alive, along with old Irish legends of wandering spectres possessed of ‘bad blood’ or ‘droch fhola’. Details: Custom House Quay; rowangillespie.com. Ok, so Greystones is a full 52 minutes (by southbound Dart) from Dublin. Dracula thought nothing of making journeys, however, so why should we? Stoker’s ‘Lost Journal’, covering 1871-81, was recently published together with annotations by Prof. Elizabeth Miller and the author’s great grandnephew, Dacre Stoker (Robson Press). By all accounts, Stoker’s handwriting was as shocking as his blood-quaffing count. The above passage is “a first attempt by Bram at writing descriptive prose in a sea-side town called Greystones,” Dacre Stoker recently told The Irish Independent. Details: Greystones Dart Station; bramstokerestate.com. This feature originally appeared in The Irish Independent.